At IndoDefence 2016, the Company IAG (International Armored Group) presents two types of armoured personnel carrier (APC), the Guardian and Jaws which are now in service with many countries all over the world and combat proven. The Portuguese high tech industry EID is showcasing its electronics, communications and command & control products at Indodefence 2016, Jakarta. The naval and land systems are especially highlighted for the exhibition. At Indodefence 2016, Jakarta (Indonesia), the well-know Turkish company Roketsan displays its Long Range Antitank Missile System, also know as UMTAS, and Laser Guided Long Range Antitank Missile System L-UMTAS during the exhibition. The L-UMTAS has been defined as one of the official missile systems of the T-129 ATAK helicopter. At Indodefence 2016, Jakarta, Emirates Special Vehicles presents its wide range of products and services. The United Arab Emirates (UAE) company manufactures and deals in special vehicles such as Armoured Civilian Vechicles, Armoured Personnel Carriers and Cash in Transit (CIT) vehicles. At Indodefence 2016, the International Tri-Service Defence Expo & Forum held from 2 – 5 November in Jakarta, Indonesia, local company PT Pindad unveiled the Sanca (meaning snake in Indonesian). Presented as "indonesia resistant armoured vehicle" this project is based on Thales' Bushmaster MRAP. ENTRAP (Ergonomic Trauma Protection) is an anti-ballistic system developed by a consortium of three Malaysian universities in collaboration with the Indonesian vertical textile and garment company Sritex. 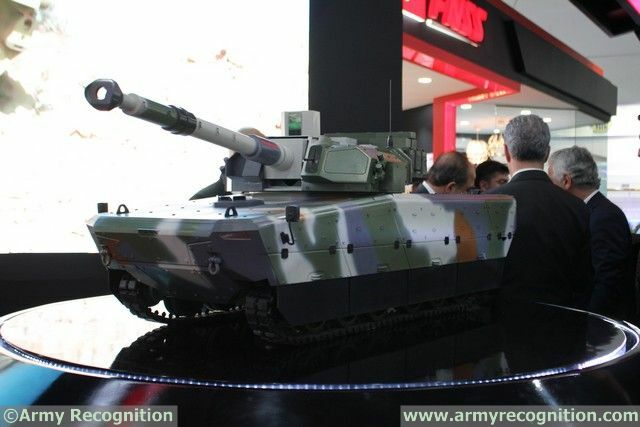 The device is unveiled for the first time at Indodefence 2016. Sritex is a worldwide prominent partner in supplying military uniforms public authority and professional users with over 30 countries. Sritex is designated to be the official partner outside Europe to produce military uniform for NATO. At Indo Defence 2016 Rheinmetall is emphasizing the Group’s status as a leading supplier of soldier systems, along with its unsurpassed ability to integrate dismounted troops into networked-enabled operations. At Indodefence 2016, Jakarta, Rosoboronexport (part of the Rostec State Corporation) is presenting 225 pieces of military hardware for all branches of the armed forces. The state-owned arms trade company is the organize of the Russian display on nine stands by major domestic defense manufacturers. For more than 25 years, SERT offers a wide range of mobile field utilities for Defense and Security sectors to improve the life support in critical conditions. At Indodefence 2016, the French company highlights the latest addition to its range of support trailers: the CR 300 mobile field kitchen in an original way. Sert is using its kitchen trailer to serve meals to Indodefence 2016 visitors. At Indodefence 2016, Jakarta, Roketsan is showcasing its so called CİRİT, the high precision, cost-effective weapon system introduced to the market in 2011 by the Turkish company, which has demonstrated its extensive capabilities in the combat fields. ELSEL, a leading company in the Italian defense industry, is showcasing at Indodefence 2016 its LIVET (Live Vehicular Turret). LIVET is a light dual gun remotely operated stabilized weapon station that enables gunners to accurately engage targets while safely inside a vehicle. At Indodefence 2016, Jakarta, Mats Internasional Indonesia (MII), the Indonesian leader in supply chain and logistics industry, presents its services for aerospace and defence industry. Turkey’s leading land systems manufacturer Otokar participates in Indodefence 2016, at the Jakarta International Expo Kemayoran in Jakarta, Indonesia. Otokar presents models of its wheeled armoured vehicles Cobra, Arma 6x6, Arma 8x8 and tracked armoured vehicle Tulpar in Otokar Stand. One of a number of state-of-the-art Rheinmetall system solutions, Herold is on display at Indo Defence 2016 in Jakarta. Herold is an electro-optical surveillance and fire-control system which assures continuous 360° surveillance, detection, alerting and simultaneous tracking of more than 256 moving ground/surface and airborne objects. The combined key capabilities of the Herold system solution enable the operator to constantly generate and maintain optimum situational awareness. With its long-standing tradition, excellent experts and their invention and creativity are the properties, the Czech defence and security industry is proud of to provide a comprehensive idea of the Czech industry’s capabilities and its broad portfolio of products and services at Indodefence 2016. At Indodefence 2016, the International Tri-Service Defence Expo & Forum held from 2 – 5 November in Jakarta, Indonesia, Minotor-Service from Belarus unveiled the VITIM multi-purpose amphibious armoured vehicle. Steiner’s “Intelligent” Combat Sight (ICS) integrates a laser rangefinder and a ballistic calculator into a rugged and compact tactical weapons sight. The ICS, a true electro-optical aiming device, provides trajectory compensation by automatically calculating the point of aim based on ammunition ballistics, measured distance and angle to the target out to 800 meters. At Indodefence 2016, the International Tri-Service Defence Expo & Forum held from 2 – 5 November in Jakarta, Indonesia, Swedish company Saab is showcasing its RBS 70 NG and Giraffe 1X fitted on PT Pindad vehicles. At Indodefence 2016, Jakarta, the Czech Excalibur International showcases its Unmanned Aerial Vehicle (UAV) Cantas. This is the very firts time that the company unveiled this advanced multirole UAV that can achieve several military or civilan missions. Day 1 at Indodefence 2016, the International Tri-Service Defence Expo & Forum held from 2 – 5 November in Jakarta, Indonesia. This year, over 25,000 delegates and visitors are attending this defence, aerospace and marine industry gathering with over 750 companies from 55 countries and 30 pavilion countries. FNSS of Turkey and PT. 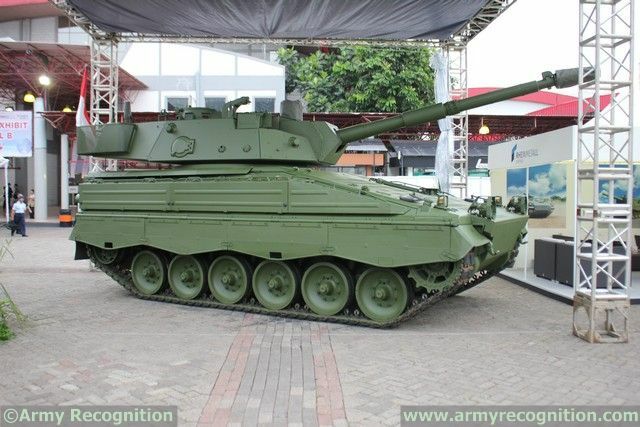 Pindad of Indonesia have advanced on their Joint Development Modern Medium Weight Tank (MMWT) project. The conceptual design of MMWT has been completed and will be revealed during Indo Defense 2016, International Tri-Service Defence Expo & Forum, from 2 – 5 November at the Jakarta, Indonesia. A major focus of Rheinmetall’s presence at the Indo Defence Expo & Forum from 2-5 November 2016 in Jakarta is the Group’s expertise in the world of tracked and wheeled armoured vehicles. At Indonesia’s Premiere International Tri-Service Defence Expo & Forum, Terma displays SCANTER Naval Air & Surface Surveillance Radars and the advanced C-Guard Decoy Launching System. Indodefence is a focal point for the aerospace, defence and maritime sectors in Indonesia and the wider Asia Pacific region. That’s why Saab is showcasing its Air Land and Naval products at Indodefence 2016. At Indodefence 2016, the Bulgarian company Optix presents its new Laser Rangefinder LRF 905-500 Compact. The tiny laser rangefinder is designed as an add-on to the thermal imaging scopes of Optix. The long range performance capabilities of up to 1550 m / 2600 m is ideal for complex combat situations and most sniper applications. With its centuries-long experience in the artillery field and historic partnership with the Indonesian armed forces, Nexter is proud to be presenting its range of artillery systems in Jakarta at the Indodefence exhibition from 2 to 5 November.